LucasArts are responsible for some of my favourite games ever. Their tireless wit has already been praised on this site in a review of Monkey Island, but here I wanted to explore a point and click game outside of the wondrous pirate series. But of course I’ll have to make comparisons to that masterpiece. Now, to hedge expectations, Full Throttle is not as good as the Monkey Island series and that’s mostly because Ben, the protagonist, is really cool. That may sound quite backwards, but there’s something special about blundering through with a slightly inept, self-deprecating character. Ben is a biker on a mission in a world quickly abandoning the sound of tyre squeal in favour of the hover car. Framed for the murder of the CEO of his beloved bike manufacturer, Ben is out to clear his name and in doing so he comes across various other biker gangs. Ben is tough and badass, and you wouldn’t want all of LucasArts’s characters to be the same. He’s certainly fun to play as, even if his dialogue isn’t as humorous as some of their other outings. That’s not to say that Ben is totally serious, his responses to your point-and-click commands are sometimes deathly sarcastic, of course he’s talking to himself and keeping the fourth wall intact, but you know the game makers are calling you out on clicking more in hope than expectation. Of course there’s not room for this witticism at every turn, so at times you have to deal with a dull negative response. It’s worth trying almost everything though, as you are rewarded some of the time with a fantastic put down. You also get the enjoyment of a fresh dynamic in conversations with people, because Ben is such a threatening character, and so are many of the rest of the people in the game, there’s high tension in most conversations, making for an antagonistic feel to much of the game. Speaking of the feel of the game, this takes place in a rather dystopian future, it’s not apocalyptic by any means, but the colour shades of much of the game (specifically when you’re in a settlement or manmade structure) focus mostly at the darker end of the spectrum, often resulting in your PC screen being close to entirely black. Compare that to the scenes of Ben riding through the country, the bright orange of the desert complemented by the blue sky makes those city scenes feel ever more ominous. The soundtrack is largely supplied by The Gone Jackals, I must admit I’d not come across them before the game, but their music is excellently chosen, it fits the brutish personalities of the biker gangs brilliantly. I’ve got this far and not really mentioned the gameplay at all. Well, it’s a point and click game, so you know the score, it’s more the Monkey Island 3 deal with a wheel of three actions than a bar with loads of different commands. There are a few deviations from the norm though. 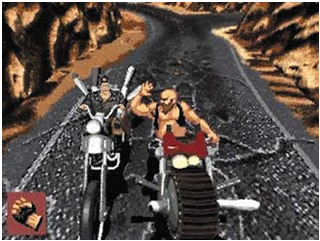 There’s a section where you must progress past ever more dangerously armed bikers using your own weapons to knock them from their bike. It’s enjoyable for a while, but unfortunately it’s not the easiest level ever so it does become quite tiresome very quickly. And there is another level involving a destruction derby which has such a convoluted way of completing it that it’s likely that you’ll need a walkthrough. I myself had to use the old fashioned technique of asking someone how to do it. As well as these specific examples, there are many occasions where Ben can actually die. Though this adds to the dark tone of the story, it does mean that you end up having to sit through a short death sequence repeatedly while you work out what to do. It can get incredibly frustrating having to listen to the same dying scream again and again and again. It’ll get bored into your skull and pop up in your dreams. As the story marches on, some characters die, giving a different feel to most LucasArts games, but some things stay consistent, like the little Star Wars references here and there. Full Throttle’s legacy is large: its creator, Tim Schafer, planned to have Ben go on a hallucinogenic trip, this was scrapped and instead we got that theme in Psychonauts, one of the most fun games I’ve ever had the joy of playing. 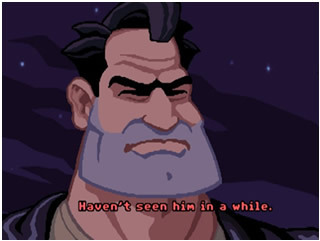 Truly, that’s enough, but I’d still like Full Throttle to get the TellTale Games sequel or remake it deserves.